Babies typically come with a lot of baggage. And by baggage, we mean stuff. From baby showers, to overexcited aunties, your child is likely to receive a lot of gifts over its time as a baby. But what do you do with all of those cute outfits they only fit in for a couple weeks or those extra strollers and baby carriers? You can either toss them or keep them. For those who are for sure having another child down the road, you’ll likely want to hold on to a lot of things. But what if you don’t know if you’ll have another? What if you are but don’t know what to hold onto and what you should let go of? While some decisions may be next to impossible regardless of the mindset you use, here are three questions to ask when sorting your baby gear between the keep and toss piles. If you have an item that constantly annoyed you or didn’t work properly, you probably should go ahead and toss it. For instance, maybe you had a stroller that you could never open on your own or you had a car seat that ended up being more affordable than safe. If you weren’t completely happy with what you had the first time around, you aren’t going to want to deal with them a second or third time around. If you have bulky items that will get in your way a lot, such as a bouncy seat or swing, consider throwing them to the toss pile. Unless you have a lot of room in your home or storage unit, they’ll only become annoying until another child comes along. If you have the space though, larger items like strollers and cribs won’t get in the way. Also consider items that are collapsible and can save you more room. Will the Item Still Be Usable? Keep safety in mind when looking at what items to keep or toss. Some items such as car seats or food are going to expire, likely before you have another baby. Also, make sure to periodically check for product recalls for items you may have chosen to keep. For durable and expensive items, however, such as bottles, these can be reused and save you money when your next baby comes along. 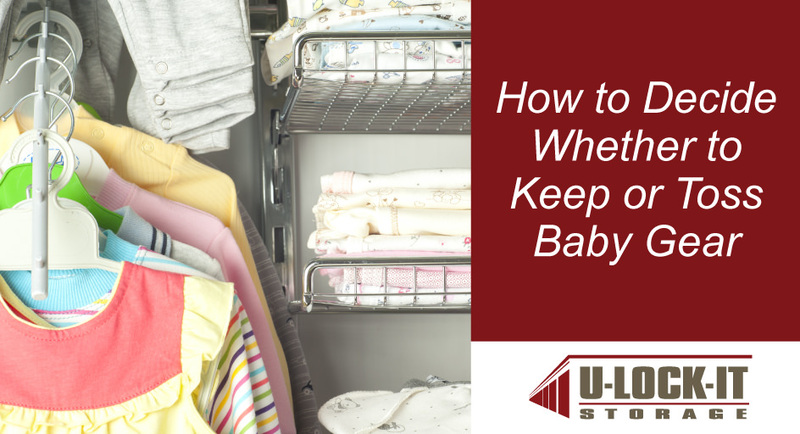 For the items that you do keep, keep them all organized in storage so that unpacking them for a new baby doesn’t become more of a hassle than buying new stuff. Organize them by season, size, category, and even gender. For those baby gear items you choose to “toss,” you don’t have to toss them to the dump (unless it’s something badly damaged or expired). If it’s something someone else could get some use out of though, your best option is to look at charities to donate to. If the items are in really good shape, you can also look at selling them in consignment stores, eBay/Amazon, or even on Facebook now. If you have plenty of baby items that you hope to reuse for your next baby, contact us today about opening up a storage unit to safely put aside your gear until you need it next.